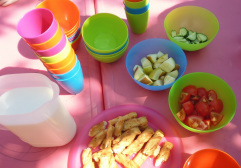 Children can choose from a variety of breakfasts including cereals, fruit & toast. Children arrive with parents/carers and self register by placing their name cards on the 'who's in today?' board and parents/carers sign their child in. The children then choose an activity to engage in. Discussion regarding the days activities, select the days 'special helper' and group activity i.e. sharing news, singing, story or games. 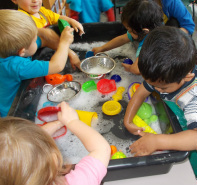 Children carry out their own plans choosing activity areas throughout the nursey. Staff play alongside children to develop their skills and extend their learning. Staff observe the children to ensure the environment meetws the changing interests and needs of the children. The snack table is available throughout this session. The children can choose when they want to drink and snack by placing their name card in the snackl box. The children help to prepare the snack box and drinking water is available throughout the day. Children discuss and recall what they enjoyed and explored during the session. Staff record quotes and suggestions the children make for further expolration during the next session. The children enjoy a group activity and then say goodbye to those going home. 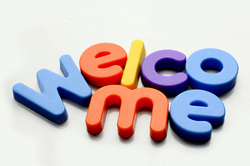 At 11.30am verbal feedback to parents/carers of those children going home. to edit. Children line up to use the toilet/ mpotty and wash their hands before taking their lunch boxes from the hallway. The children sit at tables with staff members to eat their lunch and discuss their morning's exploration and investigation. 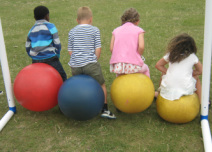 Children mix with children from Reception classes for inside and outside play, registration an snack. Home time is from 4.30pm through to 6pm.